I, for one, am excited that space travel is now a topic regularly covered on the big screen. If the general public becomes even a little bit more interested in interplanetary travel, perhaps I can see man stand on the surface of Mars in my lifetime. The Martian (2015) is merely the latest in a string of space-themed sci-fi movies that brings the excitement of outer space to theaters. While not nearly as continually intense as Gravity (2013), or as epic as Interstellar (2014), what The Martian does right is give a sense of scale to the challenge of returning to Earth from being abandoned on Mars. Matt Damon’s portrayal of Mark Watney was spot on, and the rest of the cast certainly did a great job of filling in their respective roles. The pacing was great and the CGI looked incredible. Considering the current array of NASA equipment, the ships and shelters used for a Mars mission certainly seemed realistic in this film, which should help with my aforementioned desire for the general public to become interested in interplanetary travel. 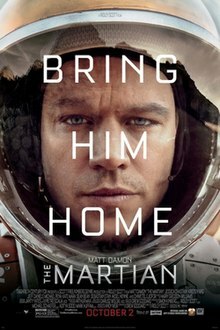 A stupendous film that gives a good visual representation of Andy Weir’s novel, I give The Martian 5.0 stars out of 5.